Wilshire / La Brea Station cutaway view looking north as envisioned February, 1983. Click to enlarge. We want to begin sharing images and plans for stations already built, under future consideration, or off the table due to alignment re-routing or changes in the planning process — as well as the stories behind them. Back when Metro Rail was headed west from Downtown down Wilshire Boulevard to Fairfax Avenue before turning north, several renderings were made of future Metro Rail subway stations in 1983. These illustrations accompanied Project Milestone reports prepared by the Southern California Rapid Transit District for the federal government. 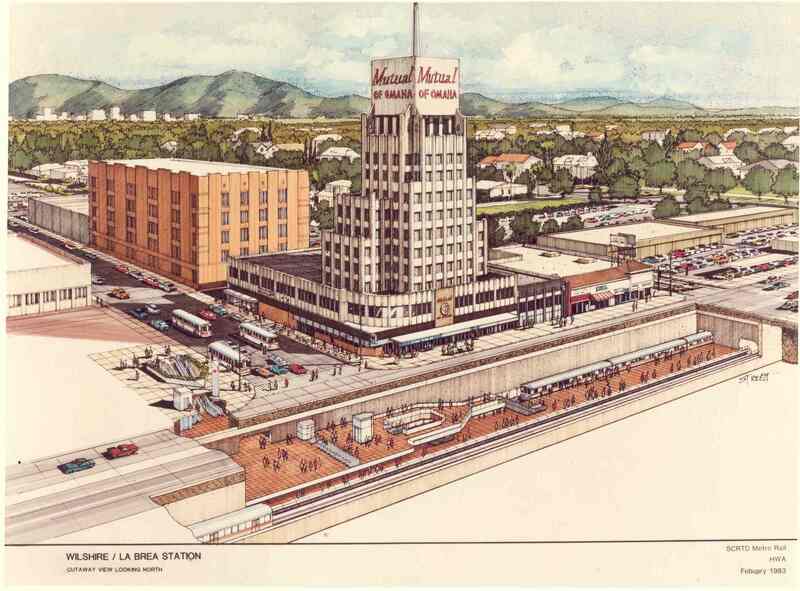 Wilshire / La Brea Station cutaway close-up, as envisioned May, 1983. Click to enlarge. The Wilshire / La Brea station was planned for the northwest corner of that intersection (site of the current Metro Customer Center). According to the 1983 SCRTD Metro Rail Project Milestone 10b Draft Report For Fixed Facilities (208p. PDF), the station would sit right under the intersection of Wilshire and LaBrea Boulevards between Detroit Street and Sycamore Avenue. At the time, the surrounding area was described as low-rise commercial and retail development with the exception of the medium-rise historic landmark Mutual Of Omaha Building on the northeast corner. The moderate patronage level projected for this station required only a single mezzanine and single entrance. More details about the early station planning can be found in the Los Angeles City Planning Department’s Proposed Plan (130p. PDF) as well as their Background Report (60p. PDF), both published in June, 1986. Obviously, these plans didn’t come to fruition. A methane gas explosion near 3rd Street & Fairfax Avenue on March 24, 1985 injured 23 people and led Congressman Henry Waxman to push for federal legislation declaring the area a “methane zone,” successfully banning all subway tunneling through it. 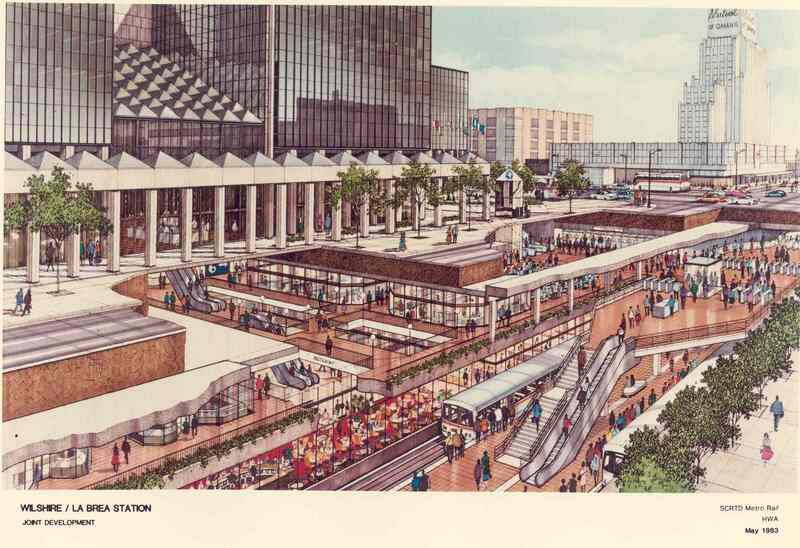 Aerial rail at Wilshire / La Brea as envisioned in 1987. 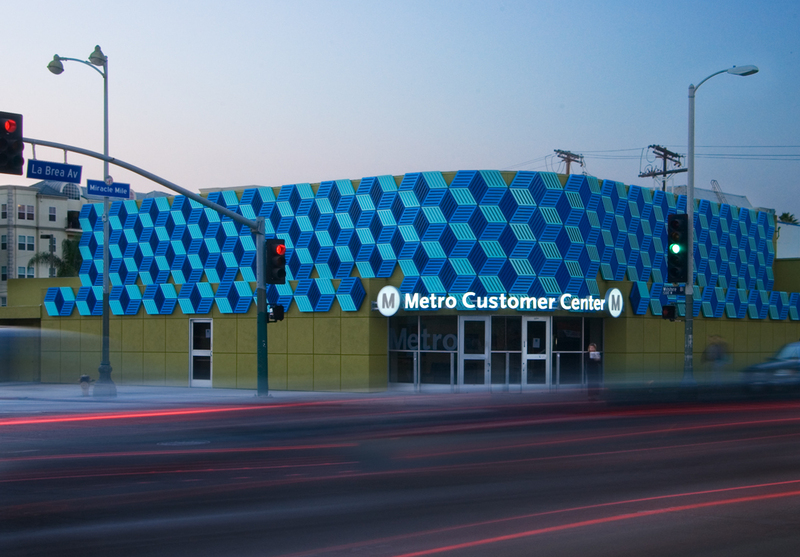 Subsequently, plans for Metro Rail west of Western Avenue were diverted south of the zone — along Crenshaw, Pico and San Vicente Boulevards. In April, 1987, the SCRTD Board passed a resolution to study “an aerial profile” along the original Wilshire route. These two artist renderings depict what Wilshire & La Brea might have looked like had Los Angeles begun building transit westward overhead. (Click to enlarge). This aerial (or “vertical”) alternative generated significant environmental impacts and issues. Another view of proposed aerial rail at Wilshire / La Brea, 1987. These included the loss of a traffic lane and/or on-street parking on a major city thoroughfare, increased traffic hazards due to the placement of guideway columns, and visual effects along the alignment including impacts on historic structures and an historic district. Additionally, substantial public opposition was expressed in response to this Wilshire aerial alternative, as evidenced by the public comments found in the 1989 Final Supplemental Environmental Impact Statement/Report (493p. PDF) for the Metro Rail project. Plans for overhead rail were abandoned shortly thereafter, and the westward spur of the subway (now known as the Purple Line) reached only as far as Wilshire / Western, beginning service in 1996. In 1998, Los Angeles County voters approved a measure which implemented a complete ban on use of Proposition A and Proposition C sales tax funds for any subway tunneling in the County. This effectively ended any chance for westward expansion of the subway in the forseeable future. However, congestion in the Wilshire corridor continued to get worse. Click here for complete information on the Westside Subway Extension. The election of subway supporter Antonio Villaraigosa as mayor of Los Angeles and new safety technology which made tunneling in the zone possible were factors which led to a reversal of the legislation prohibiting tunneling. Waxman introduced new legislation himself to reverse the ban on tunneling and it was passed in December, 2005. In 2008, County voters approved Measure R. A revenue source was now available to revive dreams of a “Subway To The Sea,” with Wilshire / La Brea the first of seven new stations proposed between Western Avenue and Westwood. The story continues to be written and we still don’t know how far west the subway will eventually go, or how a future station at Wilshire / La Brea will transform the immediate area. At least, it will surely be a far cry from how the neighborhood looked when this bus rumbled past the La Brea Tar Pits in 1960.